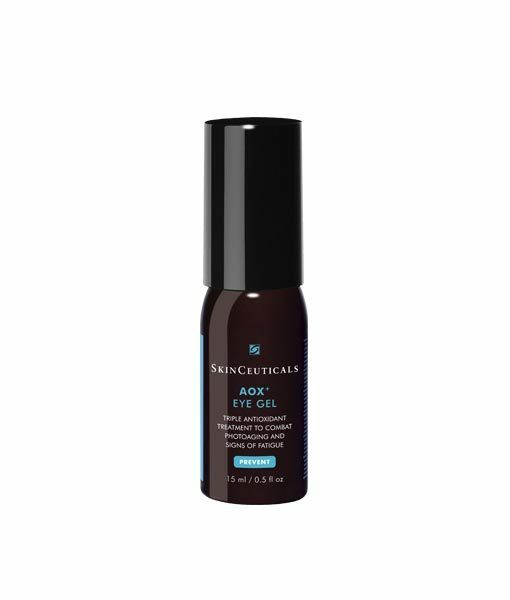 Serum-in-a-gel eye treatment helps protect against environmental damage and help reduce under-eye puffiness and signs of fatigue. This product is only sold in-office. You will earn 95 LuxePoints! AOX + Eye Gel’s serum-in-a-gel formula contains a powerful antioxidant combination that works together to help protect the delicate eye area from oxidative stress and aging-related conditions. AOX + Eye Gel helps reduce under-eye puffiness, corrects photodamage, combats signs of fatigue and restores the under-eye area to a more restful, vibrant appearance. Helps fight signs of aging. Visibly improves signs of photodamage. Protects against environmental and free radical damage. Antioxidants: 1% phloretin, 5% L-ascorbic acid, 0.5% ferulic acid: An optimal concentration of this synergistic antioxidant blend is formulated to help combat damaging free radicals, help prevent signs of accelerated aging, and help reduce existing signs of photoaging like fine lines, wrinkles and uneven skin tone. Ruscus aculeatus: Derived from a small evergreen shrub native to Western Europe, this ingredient helps reduce the appearance of puffiness caused by swelling. Caffeine: Helps reduce the look of under-eye bags. In the morning, apply 1/2 pump per eye area. Apply on the area below the eyes, on the outer corners, and on the brow bone. Maintain a distance of 3 millimeters from the mucous membranes surrounding the eyes. Do not apply product to the inner corners near the nasolacrimal duct (tear duct), below the brow bone, or on the upper lid. It is normal for vitamin C products to darken after opening due to air and light exposure. Any change in color does not affect the product’s efficacy. The SkinCeuticals was born from decades of skin cancer research that led to pivotal breakthroughs in antioxidants, their high potency formulas are concentrated in active ingredients and proven to penetrate optimally into skin. Made in the USA, this medical grade skincare is formulated to correct signs of aging, protect healthy skin, and prevent future damage. SkinCeuticals is backed by proven science to help maintain and improve skin health. 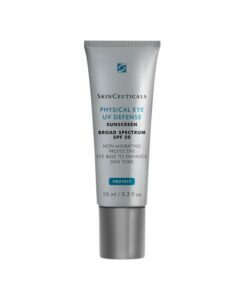 These products are only available through dermatologists, plastic surgeons, spas and other skin care professionals. 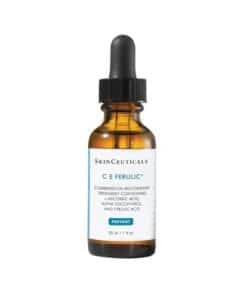 Rejuvent Skin Care sells 100% authentic SkinCeuticals products and we are authorized to sell to Rejuvent’s patients. Call 1-877-800-2147 to order.